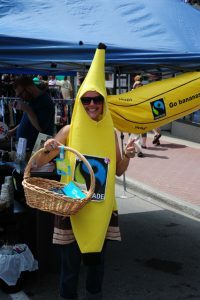 Some of our FTOÉ volunteers have a penchant for dressing like bananas at our events. It’s a fun way to deliver a serious message about the importance of fair wages and safe working conditions for banana farmers – and indeed all farmers. Swedish independent filmmaker Fredrik Gertten drew attention to the plight of Nicaraguan banana plantation workers who were exposed to the pesticide Nemagon with his 2009 documentary Bananas!*. After the workers had their day in court against Dole Fruit and Dow Chemical, the real story began. The sequel meta-documentary Big Boys Gone Bananas! *, about Gertten’s battle against Dole to have the original film shown, is playing this weekend at the Bytowne Cinema – consider it an appetizer before the FTOÉ/Canadian Organic Growers movie event on August 28. Movie Night – What’s Organic about Organic?